Twenty-seven of the artists participating in Print Fair North on November 8 & 9 have included a framed print in this exhibition. All the prints sell for $150 – grab and go! It’s a great opportunity to preview work by these artists: Audrey Blood, Neil Brigham, Anne Burton, Peter Cangialosi, Liz Chalfin, Sally Clegg, Olwen Dowling, Adrienne Figus, Nancy Haver, Jenny Gover, Marsha Humphrey, Sheryl Jaffe, Kate Jenkins, Tatiana Klacsmann, Elisa Lanzi, Diana MacKenzie, Tekla Mcinerney, Larinda Meade, Lynn Peterfreund, Erika Radich, Hannah Richards, Julie Lapping Rivera, Susan Rood, Joyce Silverstone, Jamie Sweeney, Richard Turnbull, and Joan Wright. Be sure to come to Print Fair North to see lots more work by these artists and others. 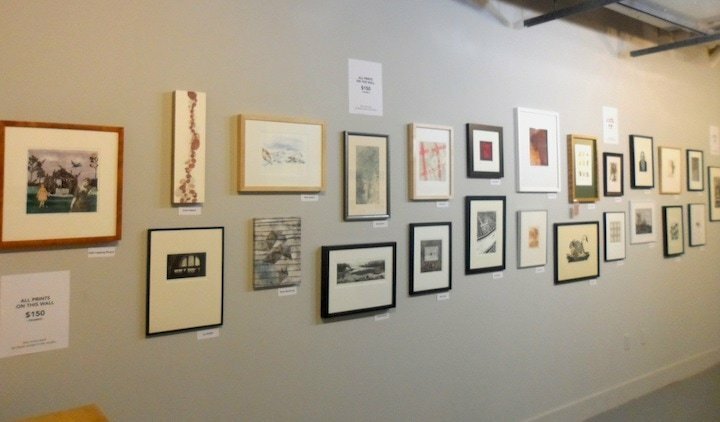 In addition, our Print Raffle 2014 is on display in the gallery. But you don’t have to come to the studio to buy a raffle ticket or see the prizes – just visit our on-line Raffle Page and help support the Ruth Chalfin Memorial Scholarship Fund!